Welcome to the joint blog of sister imprints Ecotone magazine and Lookout Books! 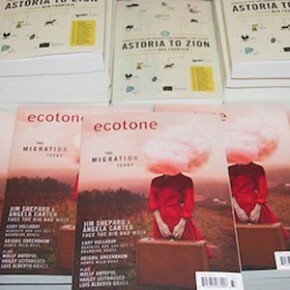 Ecotone’s mission is to publish and promote the best place-based work being written today. The award-winning magazine features writing and art that reimagine place, and our authors interpret this charge expansively. An ecotone is a transition zone between two adjacent ecological communities, containing the characteristic species of each. It is therefore a place of danger or opportunity, a testing ground. The magazine explores the ecotones between landscapes, literary genres, scientific and artistic disciplines, modes of thought. Lookout is more than a name—it’s our publishing philosophy. Lookout seeks out emerging and historically underrepresented voices, as well as overlooked gems by established writers. In a publishing landscape increasingly indifferent to literary innovation, Lookout offers a haven for books that matter. Lookout manuscripts are solicited from the pool of writers published in Ecotone. We believe in developing lasting relationships and partnering with authors, setting a standard for editorial excellence, and publishing well-made and attractive paperback originals. Books are vital to our culture, and we want to sustain them by rethinking traditional publishing models. Ecotone and Lookout are produced by faculty and students in the MFA program at UNC Wilmington. We are thankful to our community of readers, subscribers, and donors, including the University of North Carolina Wilmington, the National Endowment for the Arts, South Arts, the Friends of UNCW, and subscribers, readers, and individual supporters.